In the fall of 2016, Magdalene Home was contacted by one of our board members, a local OB/GYN physician, about a young girl, Faauuga, who had just delivered a baby and had nowhere to live. The young mother is an American citizen, having been born and raised in American Samoa, where her family still lives. Last January, she was sent to California to work for a distant relative so she could send money home to her parents, who struggled with illness and lived in poverty with no public assistance. When it was discovered that Faauuga had become pregnant while in Samoa, the relative sent her to live with another distant relative in Medford, Oregon, who had not been able to become pregnant and planned to raise the baby as her own. Within days of the baby’s birth and while mother and baby were still in the hospital, however, the relative discovered that she herself was now pregnant and had no more use for Faauuga or her sweet baby girl. Magdalene Home happily welcomed them in with open arms and hearts! We soon learned that Faauuga had been very depressed while living with the two relatives, and she enjoyed living at Magdalene Home greatly and made friends with the other girls, who adored her sweet baby and helped her tremendously. We became very fond of them both, but, after a time, this shy, quiet girl disclosed to us that she was extremely homesick and wanted to return to Samoa to be with her family and the baby’s father, with whom she shared a very loving relationship. Her family was eager to have her back and meet their new granddaughter, Queen Ema (named for the girl’s mother), but could not afford the plane fare to bring her home. Magdalene Home board members decided that Faauuga should be with her family, so the Magdalene Home staff and board rallied together, contacting several donors and other sources, and was eventually able to raise the money for the plane fare. On the girl’s 18th birthday and when Queen Ema was old enough to travel, we flew them home to her awaiting family! She and her family were so elated and sent us photos from her birthday celebration! 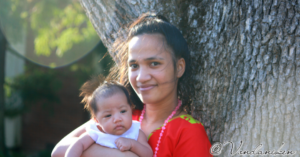 We now connect with Faauuga and enjoy watching her sweet baby’s growth via our Magdalene Home Facebook page. Magdalene Home was honored to be there when this young mother and baby needed us, and we thank our donors and supporters for helping us to create happy endings like this!